Have you seen the latest reviews of the Ford F-150? It’s been named as one of the top full-size pickup trucks, and US News & Report placed it second overall in its class with high marks in reliability, safety, and performance. The F-150 Raptor is one of the special editions for this heavy duty truck. You’ll be able to get sport performance from the Raptor that has a slightly different design than the traditional F-150. With a sportier grille and new headlamps, the design of the Raptor is definitely for off-road performance and high-speed performance. You’ll be able to get up to 450 horsepower and experience amazing maneuverability with the FOX Racing Shox suspension system. 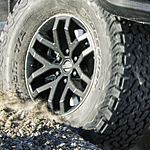 The BF Goodrich All-Terrain KO2 tires are also good to have with the off-roading package. Did you know that the Raptor has six different driving modes? You can check it out when you test drive at Woodhams Ford Lincoln.